This essay was first presented in Italian in a dialogue with the physicist Tullio Regge, former Professor in the School of Natural Sciences, as the fifth episode in a television series “Dietro lo Specchio,” broadcast by RAI 2, in Turin, Italy, October 21, 1981. In order to explain my idea it seems appropriate to tell you how my interest in the subject came about. Shortly after I came to Princeton in the fall of 1974 I was invited to join a small group of people from a variety of fields in giving some account of what was new—recent developments and promising directions for future research—in our respective disciplines. Nothing ever came of the publication project the organizer of the meeting envisaged, but I was left scarred forever by the presentation of one of the participants in that little game of intellectual show and tell, the late Arthur Wightman, professor of mathematical physics at Princeton University. Wightman spoke about the new and interesting studies of what he called catastrophe theory—that was the first time I had heard the phrase. In order to explain the subject to the laymen amongst us he gave the example of an object, like a stick placed in a stream of flowing water whose velocity is gradually increasing. The pattern of ripples caused by the obstacle develops and changes according to certain regular, mathematically definable rules, up to a certain point, literally an instant in time, after which the water becomes turbulent in the specific sense that it can no longer be described mathematically. The flow of water becomes unpredictable at the moment of what he called catastrophe. The problem of interest to the scientist was to try to push back (or forward) as far as possible the moment of catastrophe, reducing to a minimum the limit of predictability. The scientist then spoke of catastrophe, turbulence, and predictability—all of which I, as an art historian used to thinking in biblical and Christian eschatological terms, translated mentally into the term "chaos," which, as far as I can recall, Professor Wightman did not then use. Fig. 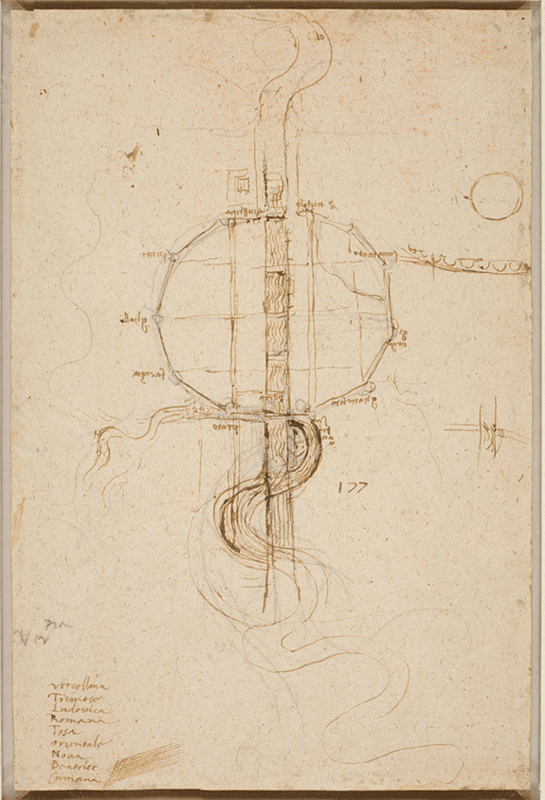 2 Leonardo da Vinci, plan for straightening the Arno, ca. 1515. Windsor, Royal Library, 12681. His presentation struck me, as an art historian, like a bolt of lightning because it gave me a completely new sense—insight, I like to think—into what might be described as one of the major categories of the mind of Leonardo da Vinci. In fact, stunning parallels can be found among Leonardo’s studies of water and hydrodynamics, not for just one or two points, but for practically every detail of Wightman's account. No less important than these details, however, some of which I will show you presently, was the light this realization in turn shed on another heretofore unposed, let alone unanswered question, namely, why was Leonardo so inordinately obsessed with water in the first place? Of course, Leonardo was fascinated by virtually everything he saw, and it could be argued that, speaking relatively, perhaps even absolutely, he saw a great deal more than anyone else either before or since. 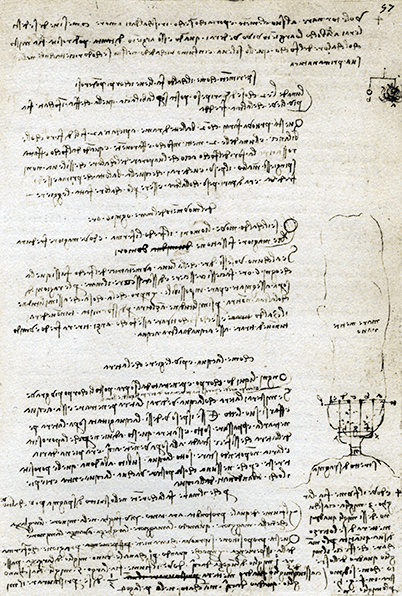 But within the vast range and depth of Leonardo's perceptual and intellectual ken, recorded in innumerable drawings and verbal observations in his great legacy of notebooks and study sheets, it is abundantly clear that water preoccupied him much more than any of the many other subjects to which he turned his attention. This is evident for several reasons. One is that water was one of his lifelong interests. He studied water practically without interruption from his youth until his death. Secondly, the study of water constituted for him a coherent theme, ranging in scope from minute observations to abstract theory. Already as a young man he planned to write a great treatise on water, and in his notes throughout his life he continued to speak of and prepare this comprehensive work. Like so many of his dreams, it was never realized; the surviving notes give no hint of how he planned to organize the work, and no indication of its line of argument, and I doubt whether it ever reached that level of conceptualization. Even so, and this is a third point that indicates the special role of water in Leonardo's thought—the sheer volume of his studies of water, hundreds of drawings and notes, exceeds by far that of his work on any other single theme. 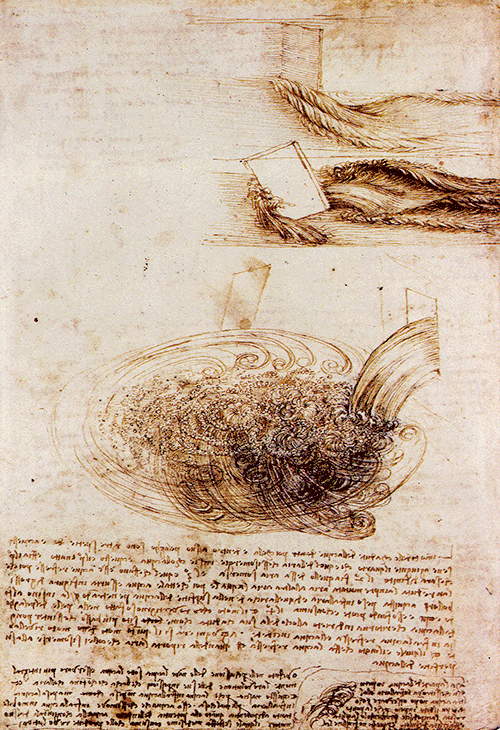 Leonardo was truly enthralled, not to say obsessed by water—so much so that this fact in itself calls for explanation. Many of his observations and theories, including some of his most spectacular and famous drawings, were of a practical nature. Some of his most fabulous and grandiose ideas were intended to achieve, sometimes quite unrealistically, concrete and useful results. He wanted to redirect the River Arno (Fig. 1) and introduce a system of canals (Fig. 2). He planned great projects and invented ingenious devices putting water to work in a variety of ways. However, the great majority of water studies were not of this kind. They are not practical but theoretical studies of what we would now call the science of hydrodynamics. Professor Wightman's explanation of turbulence and catastrophe struck me like a bolt of lightning because it suggested a reason why Leonardo had such a passion for water and its movements. Fig. 3 Leonardo da Vinci, movement of water, ca. 1492. Paris, MS. A, fol. 24v. Fig. 4 Leonardo da Vinci, movement of water, ca. 1508-9. Paris MS. F, fol. 92v, detail. (Fig. 4) Another sheet shows the same kind of study, that is, the crossings of various wave currents, and he seeks to classify each type of wave and each type of current. (Fig. 5) In another group of studies Leonardo confronted precisely the problem described by Professor Wightman, water running against and around an obstacle. On one particularly important sheet such a study appears at the upper right, illustrating the effects of shifting the angle of the immersed impediment. Below is an enlarged illustration and detailed description of water in percussion: that is, water is itself the obstacle to water, and in this case the contrast is between the resulting currents on the surface, under the surface, and surging upward carrying bubbles of entrapped air. The relationship between air and water, both in combination and as analogous media, was also a subject that greatly preoccupied Leonardo and played a critical role in the development of his thought that concerns me here. As frequently happens with Leonardo, his observations are truly amazing. 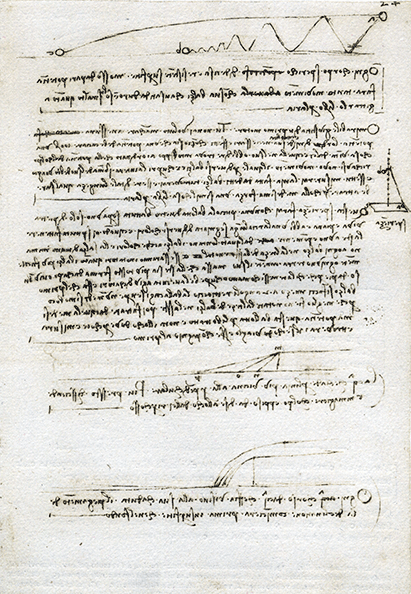 I once showed a group of the drawings to a hydraulic engineer here in Princeton, who having studied them for several weeks, was also astonished by them, reporting that Leonardo evidently saw with the naked eye, as it were, some actions of water that have been confirmed only in modern times with sophisticated methods of observation, measurement, and control. Such observations are popularly attributed to a superior physiological apparatus with which Leonardo was endowed, but I doubt it. I suspect that his studies are just as much the product of cerebration as of observation, deductions or inductions from what can be seen to take place to what must be assumed to take place. It should be said that the reverse might also occur. There are, for example, certain anatomical studies based on actual dissections, where details that Leonardo must inevitably have seen are recorded in accordance with accepted tradition, rather than direct observation. Fig. 5 Leonardo da Vinci, movement of water, 1507-9. Windsor, Royal Library, 12660v. In this case, although the effects of falling water in percussione and risaltazione are discretely analyzed and lucidly displayed, the complications seem on the verge of getting out of control, of reaching the boiling point, as it were. It was from this effect, I believe, that derived toward the end of Leonardo's life a coherent group of drawings that are among the most spectacular and mysterious works in the whole history of western art. (Fig. 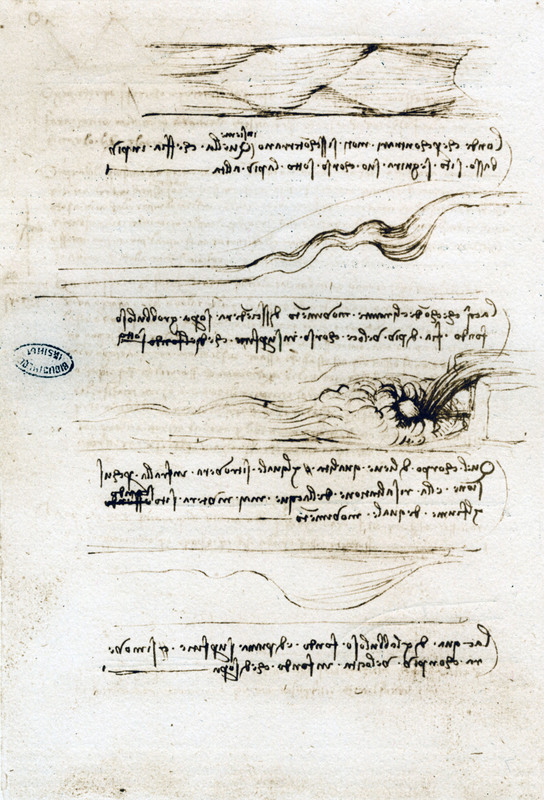 6) These are the so-called deluge drawings, preserved in the Royal Library at Windsor, in which Leonardo seems to record an apocalyptic vision of some ultimate, global catastrophe. (Fig. 7). In the drawings a landscape is seen far below—technically a bird's eye but here more aptly described as a cosmonaut's view—about to be overwhelmed by a great mass of turbulent, boiling water. (Fig. 8) In the work that seems to be the apogee of the series, only the vast storm is shown, in which rushing currents of air, clouds, rain, and water are discernible but also merge imperceptibly with one another. The drawings cannot in any literal sense represent the biblical flood, if only because that event was traditionally identified in terms of the destruction of man and beast, or their salvation in Noah's ark. Nor can the drawings actually portray the end of the world which, as was universally assumed in the Christian tradition, would come by fire. On a metaphorical level, however, the Deluge and the End of the World were closely related concepts; the End of the World was often defined as a second Deluge. Fig. 6 Leonardo da Vinci, Deluge, ca. 1512–16. Windsor, Royal Library, 12378. What fascinates me in all this is the possibility that through his studies of wave motions and currents, and especially his preoccupation with the effects of moving water encountering obstacles, including water itself and the surrounding air, Leonardo may have done something more, or at least something other than anticipate modern observations of hydrodynamic phenomena. Leonardo may have arrived not simply at an idea of turbulence and catastrophe as narrowly defined but at a concept of uncontrolled universal turbulence, akin to the ancient ideas of an original, primeval chaos—like that recorded in the second verse of Genesis: "And the earth was without form, and void; and the darkness was upon the face of the deep"—from which the world was formed and to which it will one day inevitably return. Fig. 7 Leonardo da Vinci, Deluge. Windsor, Royal Library, 12384. I suspect Leonardo had in mind something like a cognitive definition of reality, identifying rationality with the world we know and irrationality with the protogenic world we cannot know. It amounts to a kind of epistemological philosophy, or indeed an epistemological metaphysic in which order and knowledge inhabit the world that exists, disorder and ignorance that which came before and will come after. I must emphasize that this definition of a coherent and explicit cosmology is strictly my own. Leonardo nowhere speaks directly of turbulence as an abstract idea, and he has no concepts of predictability or non-predictability as such. He does express many ideas, however, that reveal a sense of inner unity and coherence in nature, ideas that suggest to me, at least, that the water studies and the deluge drawings form part of a single conceptual continuum—or rather discontinuum. The element of continuity underlies the very multiplicity and complexity of water, in which Leonardo obviously saw reflected important principles of nature. 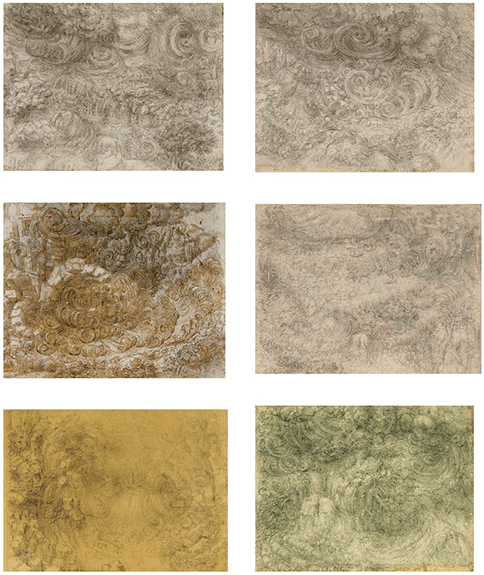 The discontinuity between the deluge drawings and the rest of Leonardo's work on water is evident in several ways. The drawings are complete unto themselves, and without the explanatory texts that frequently accompany the studies proper. There is no indication, as far as I know, that the Deluge would have been explored in the treatise on water; the concept seems to have stood apart in this sense, too, as if outside the domain of rational analysis. Fig. 8 Leonardo da Vinci, Deluge. Windsor, Royal Library, 12383. And the drawings convey a sense of general cataclysm not only by the wildly exploding and gyrating forms they depict but also because the events themselves are shown as vast, all-encompassing land-, sea-, and airscapes that fill the whole page. Conversely, Leonardo seems never to have depicted such chaotic disintegrations in isolation and on the mini-scale of his other experimental and theoretical studies. This treatment has an important psychological, not to say metaphysical concomitant by virtue of the fact that in the isolated water studies the source, or cause of the effect, whether it be a rushing stream or a cascading waterfall, was plainly evident, whereas the cause or source of the deluge drawings lies somewhere off the page, in the universe at large. One might say that in Leonardo's ken chaos appears only in large, complex systems. Perhaps the greatest miracle of all is that Leonardo managed to convey the idea of total and absolute disruption of all natural order with a piece of black chalk on sheets of paper measuring barely 6 by 8 inches. 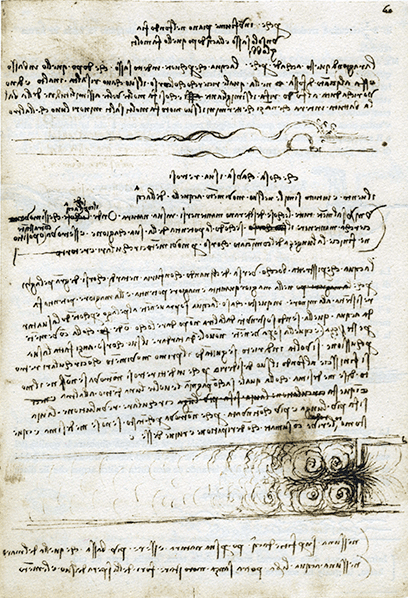 Some scholars have suggested that the drawings may refer to specific, particularly violent storms, earthquakes, and the like, that occurred in Italy and elsewhere during Leonardo's lifetime, of which he did take careful note. But no specific site has ever been identified, and even if they are related to actual events, the drawings give an almost surreal sense that the very cosmos itself is unraveling. On the other hand, they are certainly not the inchoate scribbles of a feverish imagination spinning out of control. Although the drawings themselves are not accompanied by discursive texts, we do have many comparable verbal descriptions by Leonardo of such disastrous events, and even the most horrid and pathetic of these are presented in the sharp, precise language of an objective, if impassioned observer, as subjects for representation. Fig. 9 Leonardo da Vinci, movement of water, ca. 1513. Windsor, Royal Library, 12579r, detail. The heading of this entry is crucial. Leonardo is not describing a natural phenomenon, but rather a way of visualizing his imagination, presumably in his long-planned treatise on painting. Clearly, both the descriptions and the drawings are the products of careful, detailed analysis and reflection on the theme of universal cataclysm. 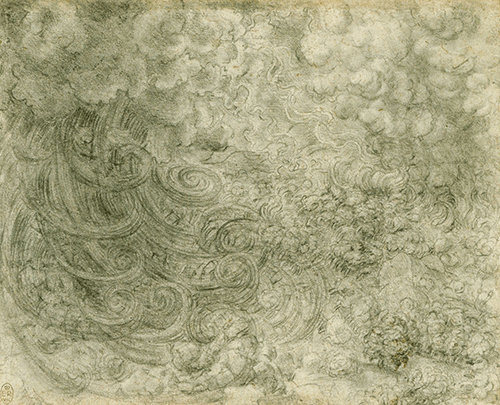 Hints of the nature of the underlying relationship between the water studies and the deluge drawings are suggested by many kinds of observations in which Leonardo connects, sometimes quite unexpectedly, widely divergent aspects of nature. (Fig. 9) In one of the drawings of water passing an obstacle, for example, the wake forms patterns that strikingly resemble tresses of braided hair. The similarity is not accidental, for in the accompanying text Leonardo explicitly describes the relationship. Fig. 10 Leonardo da Vinci, movement of water. Paris, MS. A, fol. 57r. He thus saw an underlying homology between liquids and solids under certain conditions. He drew the analogy between moving water and the movements of air—between liquids and gasses, or between hydra- and aerodynamics, we would say; and between the movements of fishes and birds in their respective media. He observed the similarity of the network of channels formed by a river and its tributaries, to the network of blood vessels in the body; that is, he saw a dynamic mechanism common to the drainage system of the earth and the human circulatory system. All this shows that with astonishing breadth and depth of observation and conceptualization Leonardo passed from one domain of nature to another, and he was able to do so precisely because he perceived the underlying community between aspects of the world that seem superficially quite unrelated. What he arrived at, finally, was an independent, abstract notion of pure force or movement, and I believe this universal dynamic is the global idea embodied in the deluge drawings. Considered in this light, it is no accident that precisely in his studies of water Leonardo defined two basic principles that remain central to our own understanding of the inner workings of nature. One of these is now called the principle of continuity, which he illustrates in two complementary drawings, one concerning the width, the other concerning the depth of a river. Fig. 12 Leonardo da Vinci, diagram of the law of rebound, ca. 1492. Paris, MS. A, fol. 24r, detail. Again discounting the effect of friction, the formulation is incredibly simple, beautiful, and complete, especially considering that it was far from obvious to the naked eye, and scarcely the product of intuition. Leonardo must have reasoned it through. Fig. 13 Leonardo da Vinci, vortices of water turning back, ca. 1492. Paris, MS. A, fol. 60r. (Fig. 14) The ideas of continuity and conservation taken together in turn underlie Leonardo's wonderful studies of vortices and whirlpools created in a widening channel when the swiftly moving water encounters the slower water ahead and compensates by turning back upon itself. To my mind, the coincidence of opposites embodied in these notions reflects a rational conception of the universe based on the assumption of an underlying symmetry in nature. Indeed, one might say that the almost Einsteinian ideas of a single force and an ultimate symmetry constitute the twin peaks of Leonardo's studies of water. Fig. 14 Leonardo da Vinci, vortices of water turning back, ca. 1492. Paris, MS. A, fol. 60r, detail. "The first book of the waters. Past Professor Emeritus in the School of Historical Studies, Irving Lavin is one of America’s most distinguished art historians. He has written extensively on the history of art from late antiquity to modern times. His interests have focused primarily on the correlation between form and meaning in the visual arts. W. 12665v; Richter 1970, I, p. 306-7, No. 608: DILUUIO E SUA DIMOSTRAZIONE IN PICTURA Vedeasi la oscura e nvbolosa aria essere conbattuta dal corso di diversi vēti e avvilupati dalla continua pioggia e misti colla gragnuola, li quali or qua ora là portauano infinita ramificatione delle stracciate piante, miste con īfinite foglie; d’intorno vedeasi le antiche piante diradicate e stracciate dal furor de’ venti, vedevasi le ruine de’ mōti, già scalzati dal corso de’ lor fiumi, ruinare sopra i medesimi fiumi e chiudere le loro valli; li quali fiumi rīgorgati allagauano e sōmergieuano le moltissime terre colli lor popoli (and much more). W. 12579r; Richter 1970, I, p. 200, No. 389: Nota il moto del liuello dell’ acqua, il quale fa a vso de’ capelli, che ànno due moti, de’ quali l’uno attēde al peso del uello, l’altro al liniamento delle volte; così l’acqua à le sue volte revertiginose, delle quali vna parte attende al inpeto del corso principale, l’altro attēde al moto incidēte e reflesso. MS A, fol. 60v (no illustration); Gombrich 1976, p. 139 n. 32. Pedretti-Clark, 1968, I, p.55, II, pl. 12385; I, p. 56, pl. 12387. Primo libro delle acque. Il nulla ha superfizie colla cosa e la cosa ha superfizie col nulla; e la superfizie della cosa non e parte d'essa cosa: seguita che la superfizie del nulla non è parte di tal nulla, onde è necessario che una superfizie sola sia termine comune di due cose che sieno in contatto: come la superfizie dell'acqua non è parte d'acqua e per conseguenza non è parte dell'aria, nè altri corpi infra lora s'interpone. Che è quel ch'adunque che divide l'aria dall'acqua?...Brizio 1980, pp. 545f., Cod. Arundel (Brit. Mus. MS 263), fol. 159a/b (my translation).